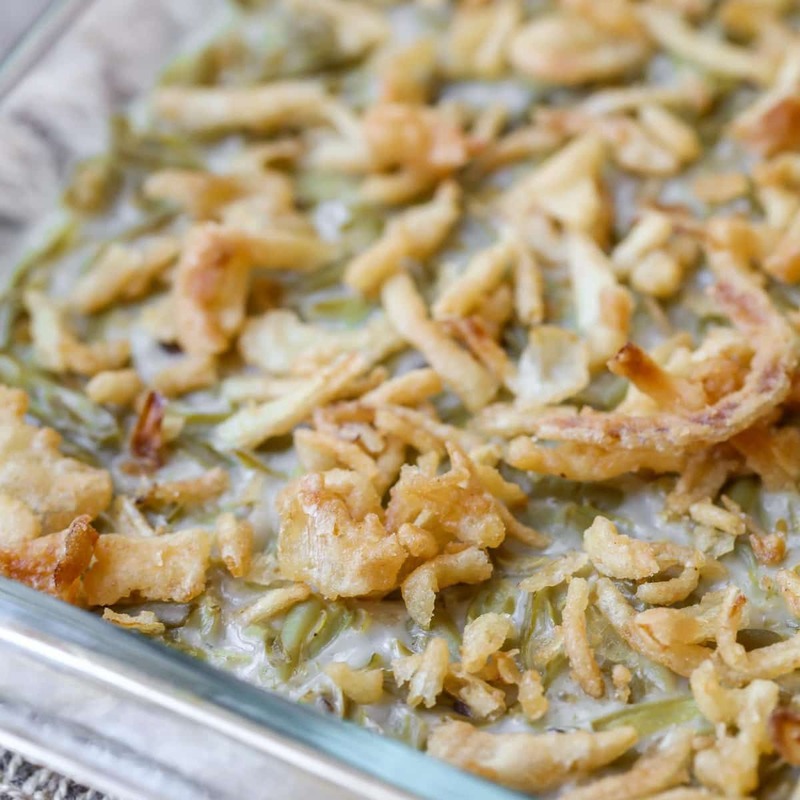 Green Bean Casserole is a classic side dish, especially at holiday meals! 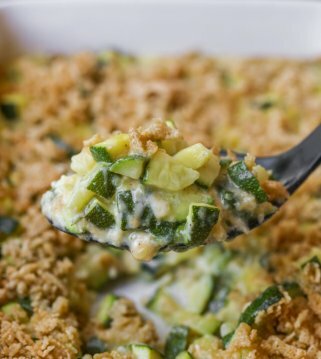 This savory casserole is simple, delicious and requires only 4 ingredients, which makes it the perfect addition to your holiday menu! Today’s dish happens to be a Thanksgiving classic! 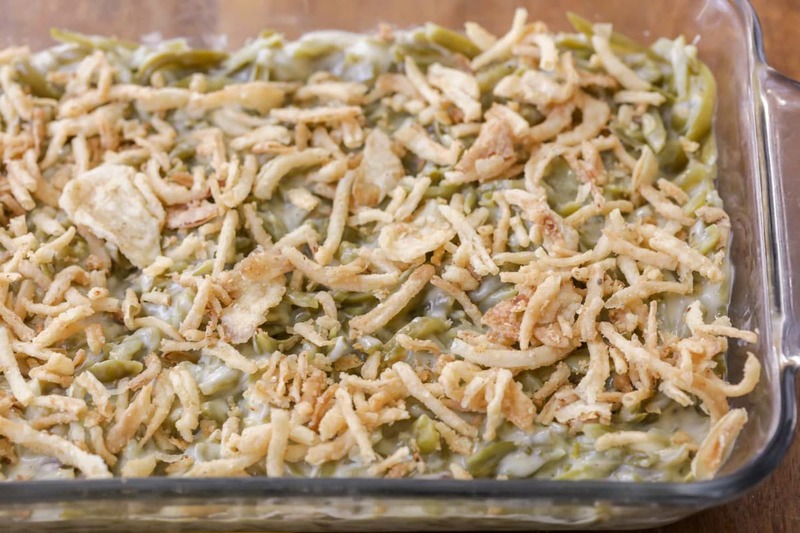 I’m sure most of you have tried it before, but if you haven’t I highly suggest giving this easy Green Bean casserole recipe a try. 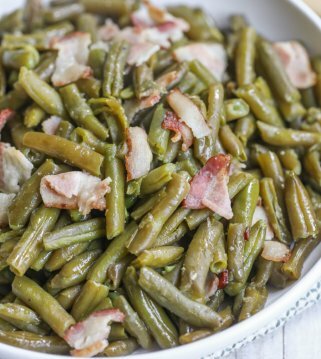 It’s probably the best way to serve green beans and is a great recipe to make as a simple side to the rest of the Thanksgiving feast. 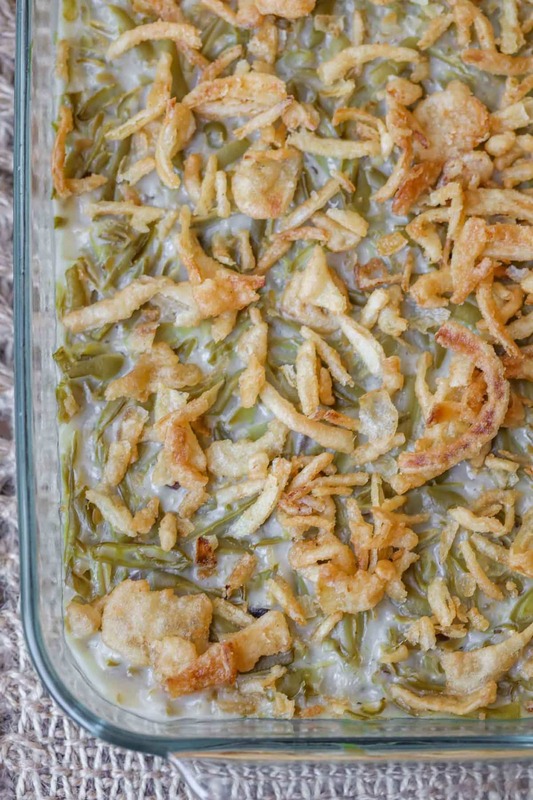 This homemade green bean casserole is literally the easiest casserole you’ll ever make. Only 5 minutes of active prep time, and FOUR ingredients! It truly is so simple! You just stir together everything but the onions, add some salt and pepper, put it in a 9×13 dish, and bake in the oven for about 20 minutes. Then you add French’s fried onions on top and bake for an additional 5 minutes. Simple as that. 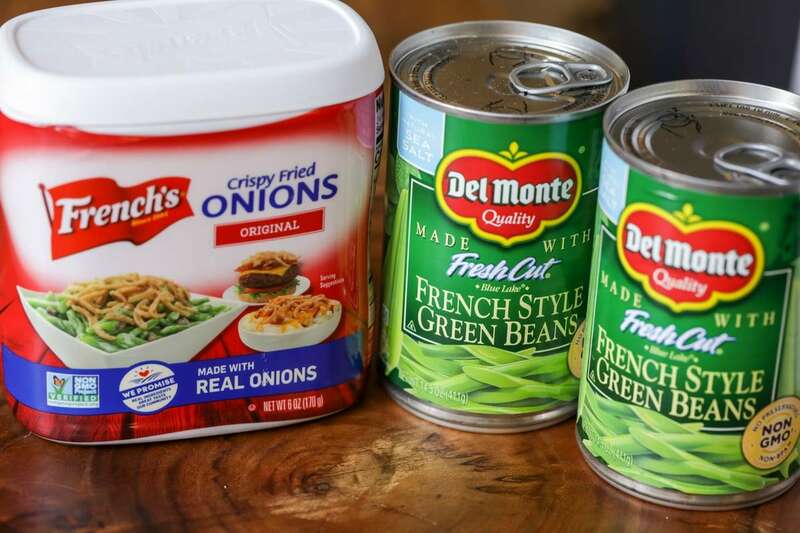 Can I use fresh green beans in green bean casserole? 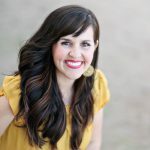 Yes – you just need to trim the ends first and if they are large, cut them in half. These fresh green beans are more crispy, but if you like the softer texture found in canned green beans, you can pre-boil them first for about 7-8 minutes. You can make this casserole 24-48 hours in advance and keep covered in the fridge. Be sure to add the fried onions right before baking. 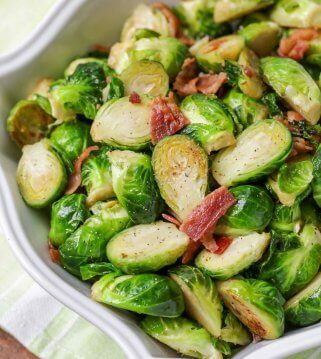 BACON – add some cooked, chopped bacon to the recipe to make it a green bean casserole with bacon. SO good! FRESH GREEN BEANS – use 3-4 cups of fresh, cut green beans instead of the canned version for more freshness. 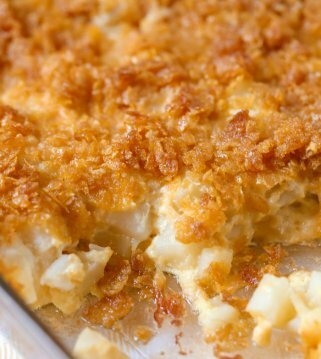 CHEESE – Add 1 – 1 1/2 cups shredded cheese to the mix to add more flavor and cheesiness to this casserole. CREAM OF CHICKEN – use this instead of cream of mushroom if you know there are no mushroom fans in the house. 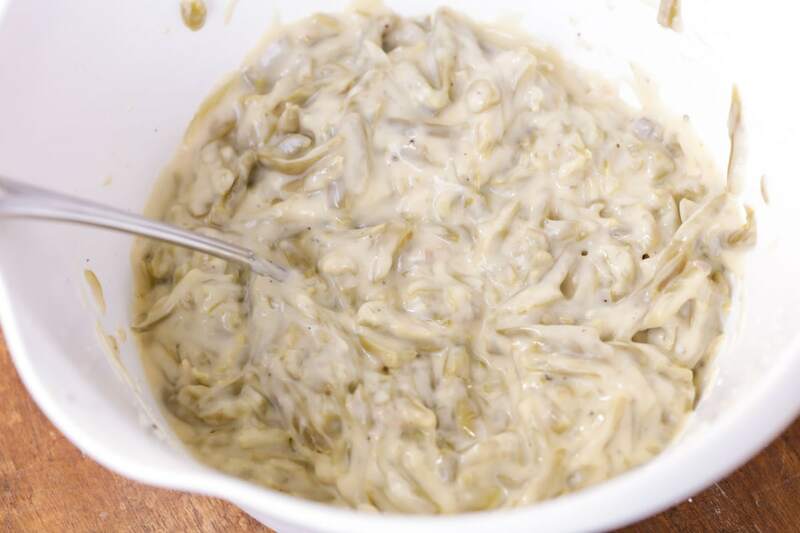 what to serve with green bean casserole? Mix green beans, soup, milk, salt and pepper in a bowl and pour into a 9x13 dish. 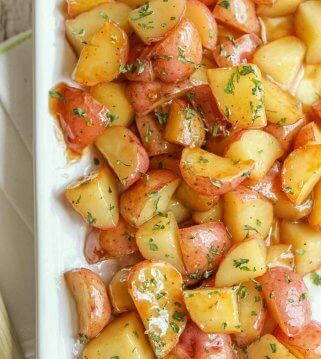 Bake for 18-20 minutes and top with onions. Bake for an additional 5 minutes and ENJOY! This is great! I love simple and easy to follow recipes. Would love to try this. Thank you for sharing this recipe. You are so welcome!! I love those kinds of recipes, as well! Hope you like them! I made this for a large family gathering and was happy to see that almost the whole dish was eaten. This is my new favorite recipe, and apparently my families too. 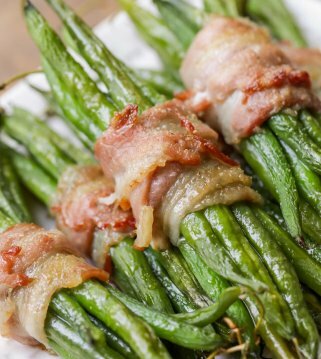 This is the best way to eat green beans. I am not the hugest fan of them, but I love the crunch from the French-fried onions & taste, that I didn’t mind them. I can’t wait to take it to Thanksgiving this year! 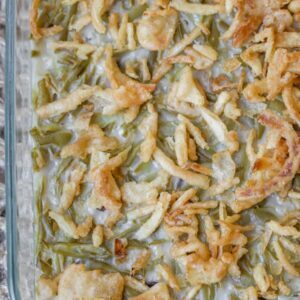 Green beans have never been my favorite, but eating them in this casserole makes them taste so much better!! I love the crunch & taste. It was also so easy to make, which I love! Green beans are a favorite veggie. This dish is so easy to make and takes no time to put together. A great side for a nice meal!